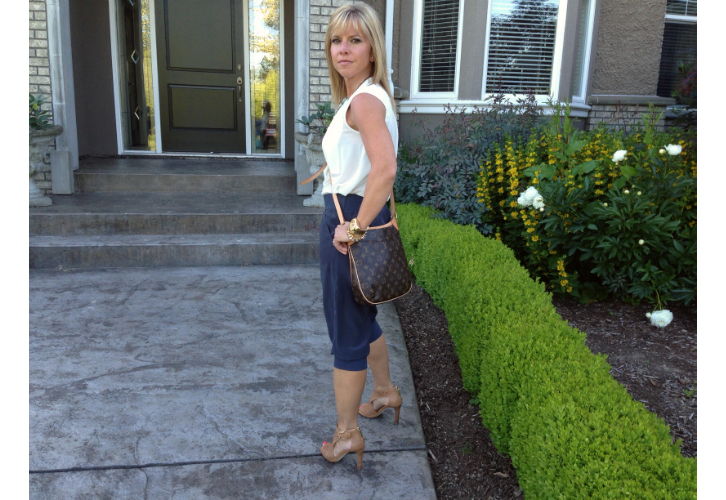 So, Laurel looks fab in the fuller printed pants that are everywhere this spring as you can see here. I’m shorter and any extra weight I carry attaches itself to my thighs, so pattern and extra fabric in that area does me NO favors. These cropped pants I found at Anthropologie 3 years ago on the sale rack are definitely a hybrid of today’s trend, but they definitely work better for me. They aren’t as full and the cropped length work better for my height. I also love that they are silk…so you can dress them up. And the slate blue color acts as a neutral. They seemed a bit odd when I bought them…maybe a bit ahead of the trend. But they are right on the money now! In looking for current available styles, they are also called cropped joggers. Not all trends work on every body shape. Pick what works for you and shows off your assets. Or like I did, make a trend work for you! This is an aside, but let’s just talk about the gold watch for a moment. I like a large, chunky watch. This is actually a men’s watch that I found on Bluefly….ok, it retails for $595 and it now on sale for $69.99! That’s the kind of deal that gets my adrenaline going! Sleeveless Shirt: JoeFresh, old. Similar by JoeFresh here and here.